It is not often one gets to not only see but hold something historically and personally significant as I was able to do recently in Florida State University’s Robert Manning Strozier Library Special Collections and Archives Reading Room. 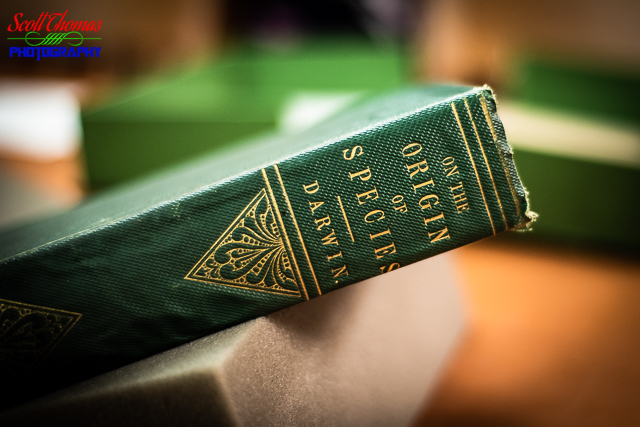 One of the archivists brought out a 1st Edition of Charles Darwin’s landmark book titled On The Origin of Species. Written 100 years before I was born, Darwin’s work has been with me almost from my beginnings. A signed note by Charles Darwin inside an 1859 1st Edition On The Origin Of Species seen in the Reading Room of the Strozier Library Special Collections at Florida State University in Tallahassee, Florida. Nikon D750/50mm, 1/60s, f/1.8, ISO 220. What made this book special was it was a gift from Darwin, himself, to a colleague in which he penned a signed note dated January 23, 1860. While separated by over a century of time, I touched this page and felt a connection. 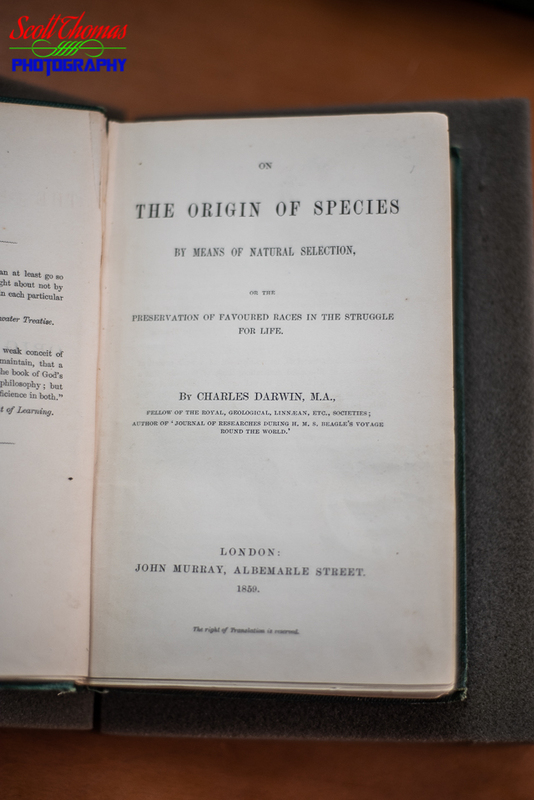 Title page for an 1859 1st Edition On The Origin Of Species by Charles Darwin seen in the Reading Room of the Strozier Library Special Collections at Florida State University in Tallahassee, Florida. Nikon D750/50mm, 1/60s, f/1.8, ISO 160. As a naturalist and biologist, Charles Darwin observed the world around him and saw things others missed or had been taken at face value. Darwin noticed how similar species separated by distance or natural barriers varied and documented the differences. He found birds, mammals and plants surprisingly suited to their environment. Almost by design. 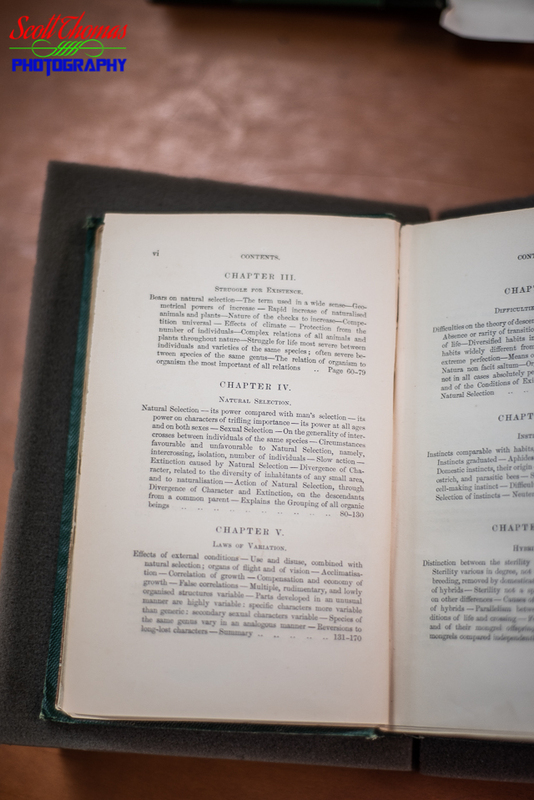 Chapter page for an 1859 1st Edition On The Origin Of Species by Charles Darwin seen in the Reading Room of the Strozier Library Special Collections at Florida State University in Tallahassee, Florida. Nikon D750/50mm, 1/60s, f/2.8, ISO 160. While Darwin’s entire book was a scientific breakthrough, the chapter on Natural Selection was the most controversial. He theorized how animals were not designed but adopted over time and generations to find their environmental niches. External forces such as competition with their own kind for resources allowed the most fit to breed and improve. People took offense to think they had evolved from a lower form of animal. Yet, 159 years later, Darwin’s theories have stood the test of time and peer review despite many religious and legal challenges. I am referring to the famous Scopes Trial back in 1925 which put evolution on trial. I highly recommend you find a copy or digital streaming service to watch the cinematic account of the trial, Inherit the Wind. Though fictional, the movie brings out the arguments of both sides in an intelligent and entertaining way. Upon learning of Darwin’s theories when still in grade school, I have always kept them in mind when observing nature in all forms. I ask and research how particular animals came to be and how they have evolved. Sadly, Man has accelerated changes all over the Earth and faster than any other time in its billions of years of existence. Changes like deforestation of the great rain forests, warming of oceans and human sprawl are causing a high rate of extinctions world wide some 1,000 to 10,000 times which should occur naturally. Eventually, these changes will even push humans past what they can adapt to. 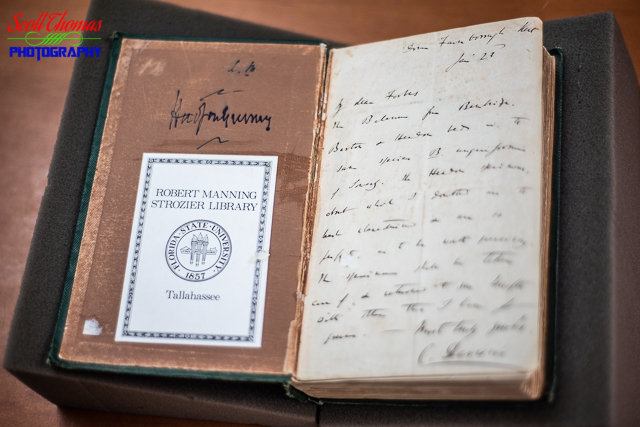 This entry was posted in Weekly View and tagged 50mm, book, charles darwin, evolution, f/1.8, first edition, florida, florida state university, fsu, natural selection, nifty fifty, nikon D750, on the origin of species, special collections, strozier library, tallahassee. Bookmark the permalink.